The NedFurtado Circuit Race is on for Saturday up at DMR. In case you are wondering, the title NedFurtado is an attempt to honor the names of two great Durango champions, 1990 mtb world champions’ Ned Overend and Juli Furtado. Remember that 20 years ago, the both of em’ laid victorious sweat on the very dirt that we will soon be shredding. With the help of Durango Coca-Cola and DMR, DEVO is pleased to be announcing the return of mtb action to DMR. 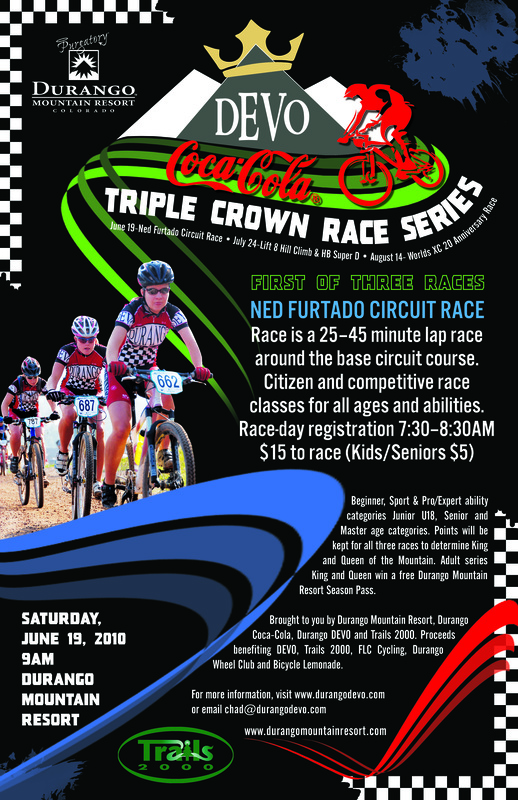 This saturday the 19th will be the opening race in the Durango Coca-Cola Triple Crown race series. The NedFurtado Circuit race will take place saturday morning, registration from 7:30-9, Beginner and Sport categories will race at 9am and will do 6 laps(could change), a one or two lap kids race at 945, and the pro/expert categories will follow at 10 with 10 laps. The course is a 1.1ish mile singletrack, double track and dirt road lap around the DMR base area. It includes several berms, mellow climbs, wallride, steep drop in, 2 bridge crossings and some possible airtime. The track was designed by Travis, Mary and Daryl Crites and built by the Trails 2000 crew with the help of DMR and Logan james of TJ Excavation. Please come up an check out the action. Below are the links for online registration through Active.com. Closes 6pm friday.